Actual economists have weighed in on whether the fast food industry could survive a $15 minimum wage, and surprise, surprise, their answer is a resounding yes. Boy, I can't wait to see how classists are going to argue with this one. 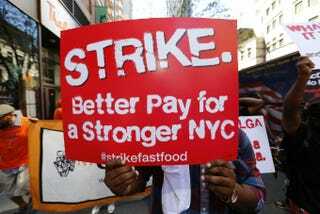 The report, from Robert Pollin and Jeanette Wicks-Lim of the Political Economy Research Institute of the University of Massachusetts at Amherst, found that if the minimum wage of $7.25 were raised to $15 over a period of four years, the fast food industry would be able to "fully absorb" the wage increase without any limit to its profit margin. The increased labor costs would be off-set by a reduction in turnover (a factor the International Franchise Association and other wage slavery apologists always seem to conveniently ignore) and slight increases in prices (specifically, the study assumes a 3% increase in prices per year, for a total increase of 12%). This leads the report to conclude that "achieving a $15 federal minimum wage within the U.S....should be seen as a realistic prospect." These price increases are, again, pretty minimal: on a fast food meal of $7.25, they come out to roughly 22 cents per year. People have commented in the past that fast food companies couldn't raise prices on anything because they've obviously figured out that however much they charge now is how much they could possibly charge without driving business away, duh, but this is a stupid point for a couple reasons. First, it assumes there's some hard number and that fast food companies aren't ultimately guessing at the specific price that would turn people away, and more importantly, it assumes that only one fast food chain would have to raise it's prices, whereas under a minimum wage increase, all of them would do so. People who eat fast food are going to continue eating fast food if it costs 22 cents more per year (especially if a lot of them have more money to spend thanks to a wage increase) — the only concern was that a price increase at one chain would drive them to another competing chain. But if every chain has to raise their prices by the same percentage, suddenly that point becomes entirely irrelevant, as the report itself makes a point to discuss. This seems an opportune time to once again point out that in many other countries, fast food workers are paid living hourly wages, and the country's fast food economy has utterly failed to collapse into a post-apocalyptic mire. The International Franchise Association and those like them keep beating the drum that profits are the only thing that matter for society, when we all know they're really the only thing that matters for them. It's not surprising that they'd conflate their interests with the interests of the country as a whole, but it's either delusional, disingenuous, or some combination thereof. The American people should matter more than the companies they work for, and it's long past time for the law to actually recognize that.